Thanks to numerous refinements made to the production design, Iomax’s ArchAngel looks quite different from the engineering demonstrator that appeared in June at the Paris Air Show. 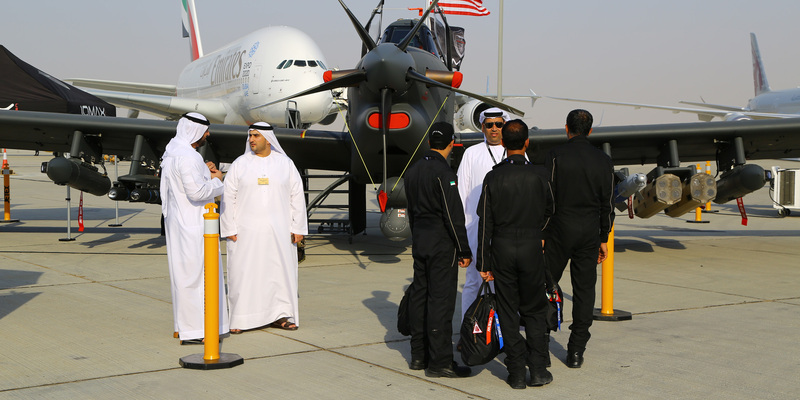 Making its public debut at the Dubai Air Show is the Iomax ArchAngel border patrol/armed ISR platform. The UAE Armed Forces have ordered the latest Block 3 iteration of Iomax’s modified agricultural aircraft, and they are in the process of receiving 24 aircraft to replace a similar number of interim Block 1 and Block 2 aircraft. The first was ferried from the U.S. in June. Compared with the earlier AT-802i Block 1 and 2 aircraft, the Block 3 has numerous differences. The airframe consists of the Thrush S2R-T660 platform rather than the earlier blocks’ Air Tractor AT-802. Iomax (Chalet S11) has considerably refined the ArchAngel since producing a Thrush-based engineering demonstrator, moving the cockpit forward by 43 inches and raising the rear cockpit for better visibility. A purpose-built forward fuel tank replaces the previous hopper-based unit, and the profile of the nose has been improved. The wingtips have been redesigned and the fin is taller to improve directional stability. The Pratt & Whitney PT6A-67F turboprop drives a new MTV-27 scimitar-blade propeller from Germany’s MT-Propeller. New throttle quadrants are incorporated in each cockpit, and there is a digital autopilot. ArchAngel can carry a wide array of weaponry, and the example displayed here carries laser-guided bombs, four-round launchers for Roketsan’s Cirit laser-guided rocket, and Hellfire missiles. The Block 3 introduces wider-spaced underwing hardpoints that can accommodate dual-rack pylons. Terma’s MASE (modular aircraft self-protection equipment) pods are fitted to the aircraft on display, each containing missile warning sensors and countermeasures dispensers controlled by the ALQ-213 electronic warfare management system. Under the fuselage is the Iomax-developed multi-purpose pod equipped with an L-3 Wescam MX-15 sensor turret. As the UAE receives its new ArchAngels, the older AT-802i aircraft have been released for other duties. Six were transferred to Jordan for ISR missions along the border with Syria, later receiving weapons capability, and others have been handed over to Yemeni government forces that are engaged in fighting Houthi and other insurgent groups. The UAE has trained Yemeni crews to fly the AT-802i at Al Anad air base, from which combat missions have been flown.